According to this article a school in France are requiring children to wear radio frequency Bluetooth tracking devices. Well, the school would like the children to wear the Bluetooth devices supplied by the start up company NewSchool – if they don’t wear the device, or if they loose it, the kids have to pay a fine of 10 Euros (£9 or $12). Not really much choice there then. The school using the radio frequency tracking device is the Lycée Rocroy Saint-Vincent de Paul, a private Catholic high school in Paris. According to the BBC ‘French school in row over tracking pupils electronically‘ more than 3200 people have signed a petition against the school RFID tagging their pupils, with one pupil’s plea over twitter. Not only will the school be able to track the kids every move, soon parents (and puzzlingly students themselves) will be able to too! “Our NewSchool Teachers app is available for teachers only. Soon, we will release an application for students and parents of students. Patience so 😉”. There is also a “Good Points” Reward package that comes with the NewSchool app, presumably for students that are compliantly tracked. d) health issues increasingly being aired with regards to wireless technology and it exposure, especially at close hand. (Wonder what her public liability insurance is like?). Similar bills introduced in 2012 by the then Representative Lois Kolkhorst, HB101 and HB102, were unsuccessful. More here on HB101 and HB102. Hopefully SB486 will be passed and Texas will be the second State in the USA that bans radio frequency identification used by children in schools to locate and transmit information. Missouri was the first US State to ban RFID in schools in 2014. SB523 came into effect October 2014 which “Prohibits school districts from requiring a student to use an identification device that uses radio frequency identification technology to transmit certain information”. RFID transmitting the location of students is used in Texas. However in Northside Independent School District (NISD) the RFID introduced in 2012 was a disastrous public relations exercise for the technology. One student in 2012 who attended John Jay High School in San Antonio, Andrea Hernandez , refused to carry the active 433MHz tag, that was going to transmit her whereabouts 24/7. The school unbudging in its commitment to have the kids wear the active RFID expelled Andrea. The Hernandez family took NISD to court, with the Judge’s decision unfortunately going against them. Andrea had to move schools. In July 2013 the RFID was scrapped. 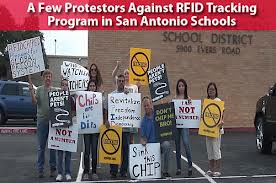 NISD had introduced the RFID to improve school attendance which it failed miserably in (obviously!). Quite how NSID expected students wearing a RFID tag around their necks would improve attendance is clearly a testament to the sales pitch of the company supplying the RFID, WADEgarcia. There were many claims made about the RFID one of which was that only the school could track the RFID tag. Not entirely correct. The RFID tags the kids were, and are, wearing in Texas utilise the 433MHz radio frequency. The same frequency used by RFID tags the US Military use to track their assets around the globe, in fact it is the very same standard ISO18000-7. So let’s be very careful when making claims about RFID technology. 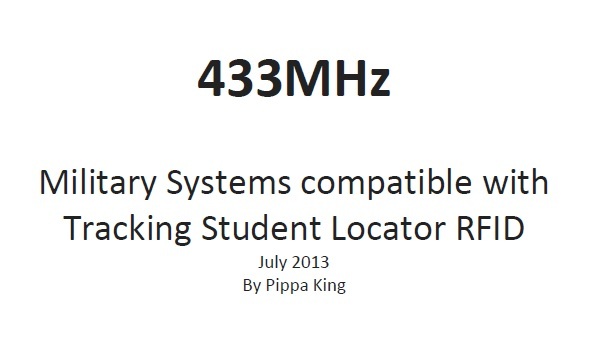 See paper ‘Military Systems compatible with Student Locator RFID‘. Hopefully SB486’s progress will highlight what exactly RFID is capable of. Not that I am suggesting the US Military is tracking children in America but only that the technology does have capabilities and is open to be fallible. The RFID Journal reports that a company in California, Iotera, is developing a 900MHz RFID tag that has a 4 mile range and that “a school district will use it to track students arriving on campus or traveling to and from school“. Rather than just being able to track students on campus this new geographical tracking takes tagging children one step further. Iotera have visions of smart cities with the Internet of Things (IoT) long-range “sensors to increase safety and efficiency” – in this company’s eyes this involves tagging humans. The figures on how dangerous it is for children attending school are unknown but it seems that participating in the activity of schooling is relatively safe otherwise why would governments insist children attend school and parents willingly send them? There is inherent risk in all activities humans do and carrying RFID chips, emitting frequencies that have unquantifiable health effects and “smart”ing cities up, bathing us all in electrosmog does not sound any safer than the situation we have now – where children are free of RFID tags. With the possible risk to health of carrying emitting RFID and the added risk of other people tracking RFID tags that children carry, by hacking into their RFID emitting signal, the “increase safety” that Iotera claim is disputable. But yet again we see the next generation via school being conditioned to use technology and be advised it is for their safety/convenience and learn that it is perfecting acceptable for others to track their whereabouts. Apart from the risks mentioned above associated with carrying RFID technology, a recent article by Slyck News “Student Monitoring by Schools, is it Really Necessary or Far Too Controlling?” addresses the glaring privacy issues that surveilling the next generation raises. Many will embrace this ubiquitous living as convenient but as our privacy quickly becomes eroded so does the erosion of any form of freedom to protest against corrupt systems. Do we have a right to refuse to use or would our anomalous behaviour flag us up non compliant citizens? Sara Mogel, ex principal of West Cheshire College. The woman who thought it was a good idea to spend over £1million of taxpayers money on RFID tags to hang round students neck to track them in real time, gets an OBE for ‘for services to vocational education‘. No reporting in the local press. No communication with parents. 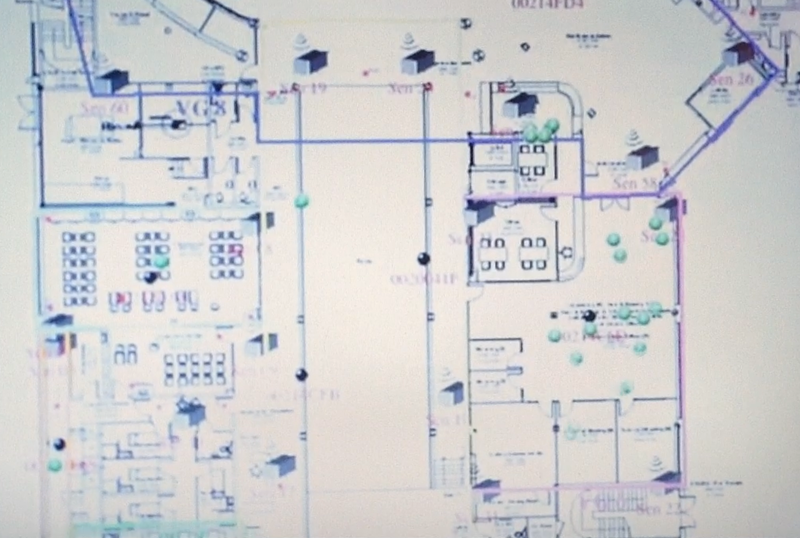 The college had no idea of the specification of the RFID, worryingly therefore no information on the specific absorption rate (SAR) of the radio frequencies on the human body. The health effects of radio frequencies (RF) on the human body are seemingly unquantifiable at present but as more research is done on this topic it is becoming more apparent that caution should be taken and prudencey exercised to limit our bodies to RF exposure. The RFID journal themselves suggest distancing the human body 1 meter from a reader/antenna. 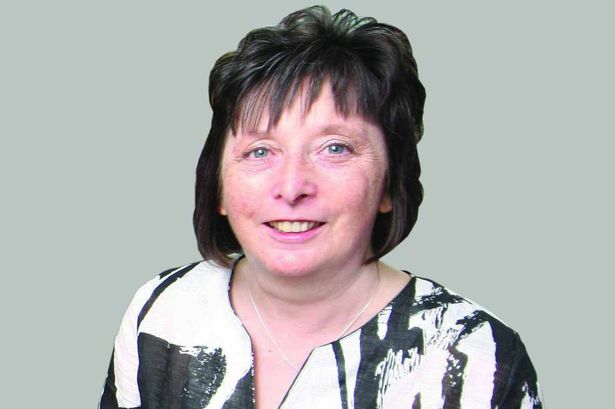 Let us sincerely hope that there will be no ill health effects from the students wearing RFID tags under Sara Mogel OBE’s watch at West Cheshire College and this does not come and bite her back in the future. Ultra wideband RFID tracking children in the UK – an invasion of privacy? It is only an invasion of privacy if one is fully aware of being tracked. If the data subject is blissfully unaware of the ubiquitous technology it carries, then there is an ignorance of the invasion of privacy the RFID tag is perpetrating. Parents of the students tagged with RFID at West Cheshire College had no knowledge their children were being tracked every second by an active RFID chip. The college can provide no literature given to students about this and no privacy impact assessment was done. The college can only “assume that information about RFID was also communicated verbally to students” during induction in which “the induction process is covered verbally with students”. An adult pops a RFID tag round a child’s neck and assumes that this second by second tracking was communicated effectively, verbally during an induction? The fact that not one student or parent objected to this rings warning bells. Did no intelligent thinking adult at the college think that possibly, just quite possibly, that verbally informing students about electronically tagging them may bring up issues of consent from a minor and that perhaps this level of communication may leave the college vulnerable to criticism and, at the very worst, possible litigation. And did no one there consider that electronically RFID tagging another human and viewing their location in real time is compromising their privacy, maybe even just a tiddy-widdy bit? Apart from the invasive intrusion of an adult peering into where children are – who they hang out with, when they are visiting the toilet, shower, school nurse – no privacy checks or advice from Department for Education, Information Commissioner’s Office (ICO), Children’s Commissioner or any legal body (see question 1 and 2) was undertaken by the college. On top of the lack of regard to procedures concerning consent and privacy considerations, the college did not know when they started RFID tagging the children. Really? – yes really. Asked about when they started RFID tagging children, under a Freedom of Information Act request, the college replied that no information was held on this at all. As this was a fairly surprising answer from the college, the Information Commissioner’s Office (ICO) who oversees the Freedom of Information Act, was asked to intervene. Indeed, amazingly, West Cheshire College also confirmed to the ICO that they really did not (honest guv) have any information about when they started RFID tagging children there. Bearing in mind that lying under the Freedom of Information Act is an offence and that “A person guilty of an offence under this section is liable on summary conviction to a fine“, we must take these answers from the college as gospel. The Guardian article failed to mention cost which came in at £1,050,242 (ex VAT). Over a million pounds of public money spent on a RFID human tracking system that there is no information about and that the college has now scrapped due to the “software would not communicate effectively to the current register system” and “escalating costs“. A million pound spent on a RFID system the college cannot not even recall when implemented? What an amazing, jawdropping sequence of events. This could almost be made into the perfect example of a ‘what not to do when RFID tagging children in education’ handbook. A truely epic fail. So back to the question ‘Is UK college’s RFID chip tracking of pupils an invasion of privacy?‘ – most probably. Here is the video of the system on Youtube – you decide. A child consenting to be tracked should be given a choice, and what about the parents right to know who is tracking their children? 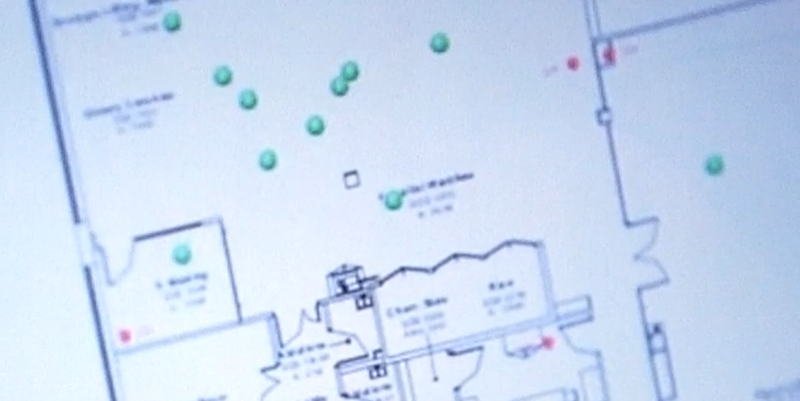 When a UK college recently used a RFID real time location system to track students on their campuses in Chester and Ellesmere Port from 2010 – 2013. Apart from whoever thought this was a good idea somewhere in the tiers of the college management, how did the college manage to persuade the thousands of students it tracked, that this was a good idea too? How did the students consent to staff being able to “… look at them [students and staff] in groups, such as peer groups.” Locations being seen in, possibly toilets, showers, school nurse, etc? When pressed further on this consent gaining process the college refuses to answer questions. Only when the Information Commissioner’s Office intervenes it is revealed quite how the college considers meaningful consent is gained from students to be tracked by an RFID tag ‘bleeping’ it’s whereabouts every second – “we can confirm that the induction process is covered verbally with students. It is fair to assume that information about RFID was also communicated verbally to students”. It’s difficult to see what is happening here – either a shocking inability of knowledge or lack of awareness of responsibility to answer basic questions under the Freedom of Information Act. But when children are tracked in this manner, literally their every move with the potential to be scrutinized, there should be absolute transparency. West Cheshire College. Nothing to hide? Then nothing to fear, surely? Well, it had to happen at some point. West Cheshire College have joined the RFID Journal and Zebra Technologies in the need to erase evidence of their part in tracking children, using a real time location system, at West Cheshire College with active RFID for 3 years since 2010. West Cheshire College contacted Youtube about ‘copyright infringement’ on the video posted on our channel detailing their RFID tagging of students. Presumably any copyright infringement is on images of the college not the content of RFID tagging the kids, as the college never claims to have ‘accepted‘ the technology stating they were only trialing tracking students (for whom?) with RFID that they used for 3 years. Does West Cheshire College’s intervention in yet more removal of evidence from the internet of RFID tagging children at the college fan the fire of an attempted cover up? Along with the of removal of press releases, articles and video by the RFID Journal and Zebra Technologies on the same topic, I’m not quite sure what else it does suggest really.